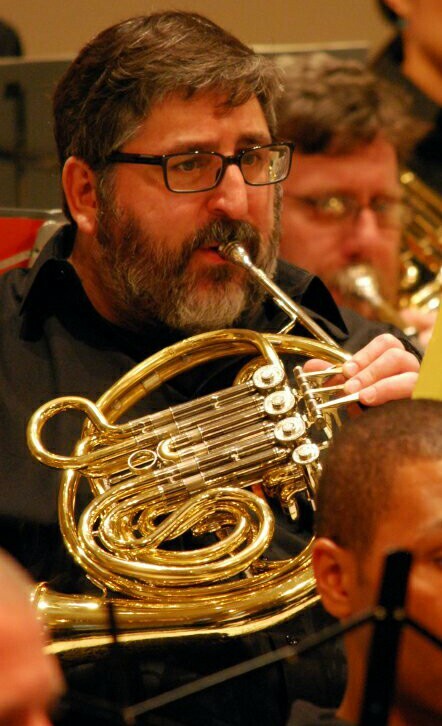 Steven is our French horn section leader, a former board member, and a founding member of QUO. In summer 2009, Jim Babcock (trombone) told me about a planned new LGBT community orchestra. I thought I’d have 6 or more months to improve while they organized, so was shocked and impressed when they were ready for the first rehearsal only weeks later. As one of only two straight men in the group (and in some past concerts the only one), it took me a while to get used to the “queer” name but the members have all been fun and engaging from day one. I’m thankful that Jim brought me into this amazing group and have enjoyed its incredible development. How long have you been playing French horn? I’ve been playing horn for 6 years again, following a 24 year break after high school. My dentist vetoed my first choice of sax and recommended a brass instrument. I don’t remember why I chose horn but only one other 4th grader started it in my class and he only lasted a short time, leaving me usually the only horn or one of 2 through most of school. Although it is difficult, I love the beauty and versatility that makes it a key part not only of orchestras, but also of legendary film scores and classic rock tunes. Dal Segno. Directing the player to repeat a section from an earlier marking, hitting a dal segno, or D.S., in the first rehearsal of a piece is marked by many orchestra members scrambling to find the mark and quickly jump backward to the right spot in their part. That kind of frantic leaping between things and finding my place again is much like my everyday life. Question from Jasmine: What neighbourhood do you live in and what’s your favourite thing about it? Hell’s Kitchen. It’s all about subway access. NYC has many great neighborhoods, but being within a few blocks of the A/C/E, B/D, F/M, N/R/Q and 1 trains makes getting around to and from almost anywhere easy and quick. When the first phase of the 2nd Avenue subway opens, the rerouted Q will make even the Upper East Side a one-seat ride from my west side street.